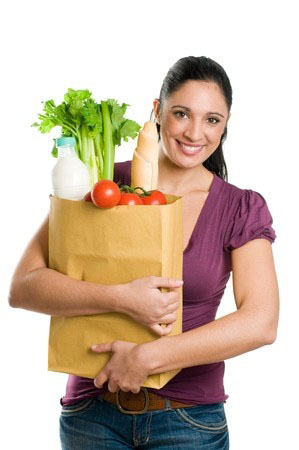 One of the biggest expenses for the average British family is the weekly shop. In fact, since 2011 the cost of the average weekly trip to the supermarket has risen by £33, meaning we're now spending almost £4,500 a year on food alone. While groceries are essential, there are still a handful of ways to help cut the costs. The first thing to do is track how much you're spending, and what on. Our free Money Dashboard budget planner is a great tool, allowing you to see all of your account information in one space, with automatic tagging showing you exactly where your money is going. Once you know how much you're actually spending, budgeting becomes easy. Simply decide what you want to spend, and stick to it by following our five top tips. Sit down at the start of the week and write a meal plan. By deciding what you're going to eat for the next seven days, you won't pick up ingredients that you don't need. Remember to include leftovers in your plan for extra money saving points. Write a detailed shopping list based on the plan to take with you to the shops - this is a great way to help you avoid costly impulse buys. Don't rely on your nearest supermarket to always bring you the best bargains. Instead, do a bit of legwork and you could save a lot of money in the long run. Investigate which supermarkets are cheaper by using online comparison sites - experimenting with virtual cash from your laptop screen is much quicker (and cheaper) than visiting every supermarket nearby. You don't need to buy from the supermarket's luxury range or shell out for brand name products to get the best flavour. It's worth experimenting with the supermarket basic range. Granted, some of the products won't be as good. However, many of them taste just the same: especially when it comes to fruit and veg. Check the ingredients for more complicated products. You might find that the branded chocolate biscuits have exactly the same ingredients as the budget range ones - the only difference is the price. If you're a member of a supermarket loyalty scheme, don't forget to use those vouchers. Last year, £220 million in unclaimed loyalty points went unspent in the UK. As soon as your vouchers arrive, pop them in your purse or wallet so you don't forget to take them with you when you do the weekly shop. It's also worth knowing about ‘raincheck' vouchers. If a special offer item is out of stock, these vouchers let you buy it at the bargain price at a later date. Tesco, Asda and Sainsbury's all offer these coupons, so don't be scared to ask a member of staff. One of the lesser known ways of saving money in a supermarket is avoiding the products placed at eye level. Supermarkets do everything they can to make more money, putting premium products where you can easily see them. You'll find cheaper versions on the bottom and top shelves, so be prepared to bend and stretch to save a few pennies.